Horseradish – also known as "Kren" in Bavaria and Austria – is used mainly as an aromatic and spicy addition in a variety of dishes. It is predominantly the root of this plant that finds its way into our food. 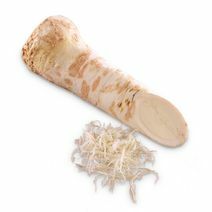 When shopping for horseradish, make sure the root is not lignified to ensure that you get the best quality. Once horseradish is cut or grated, it will quickly lose its aroma and sharpness, and will turn an unsightly brown. Make sure to only grate as much as you will need for your dish. 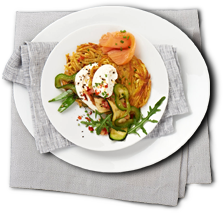 Only then will you keep it fresh, and maintain its full intensity of flavour. We only use freshly grated ingredients in our Exquisa Creation horseradish. In combination with our wonderfully fresh cream cheese, the Exquisa Creation horseradish is aromatic with a fine sharpness to tease your tastebuds.